This page is dedicated to helping you learn to tie a Woggle. In the early days of the Scout Movement in Great Britain, the Scout scarf used to be tied loose knot at the neck and naturally became very creased. However it was known the Americans were experimenting by using a ring made from bone, rope or wood to keep their scarves together. Bill Shankley, aged 18 and one of two permanent camp site employees at Gilwell Park, had the job of running the workshop and coming up with ideas for camping equipment. He found out about the American rings and decided to try and go one better. After various attempts with different materials he finally made a Turks Head knot - adopted in the days of sailing ships when seamen developed decorative forms of rope work as a hobby - made from thin sewing machine leather belting. He submitted this to the Camp Chief and, no doubt, the Chief Scout, for approval and had it accepted. Gilwell Park Scout Troop (i.e. 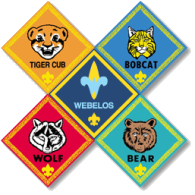 : Wood Badge holders). We are using the Woggle as a tool to encourage the Boy's to learn the Scout Oath & Law ahead of the transition in the next program year.